Christmas has come a little bit late but thanks to Warlord Games its here! The Algoryn are proud people, and it is considered a great honour to fight with the armoured infantry. They are the first to tackle a foe and almost certainly the last one to walk away. Using their latest weaponry, technology and armour there is nothing the people don’t bestow onto the armoured infantry to guarantee their warriors victory. Easy to build with a torso that can be placed on the hip ball socket for increased dynamic poses, this is a highly detailed upgrade for your Algoryn. The armour even includes part of the Algoryn alphabet, extolling the troopers in their art of war! 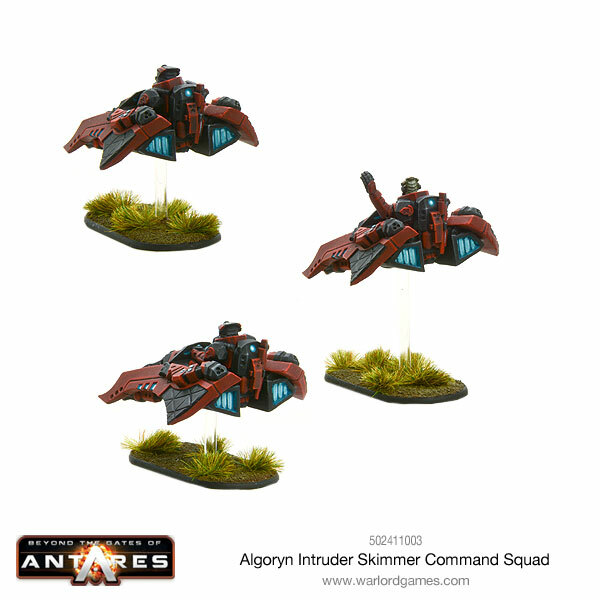 As well as that there is more to come as well for the prudent Algoryn commander who values higher mobility tactics. 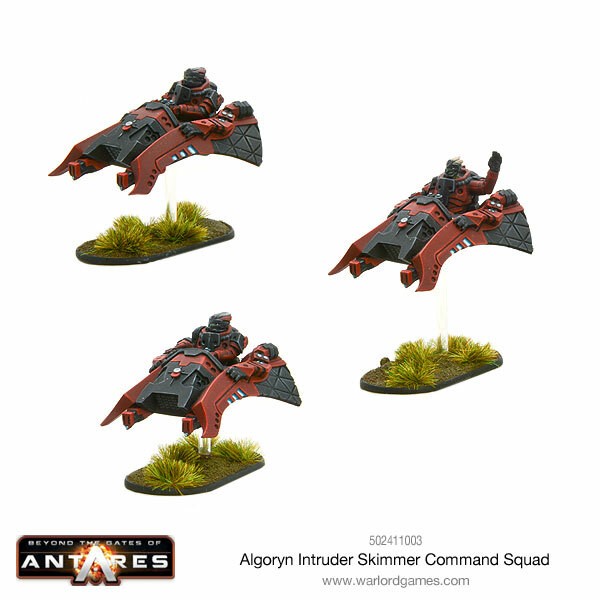 The Intruder Scout Skimmer is designed for mobility in mind, making it the ideal vehicle for the Algoryn to use for scouting and reconnaissance operations whilst still holding the ability to engage the enemy in combat. 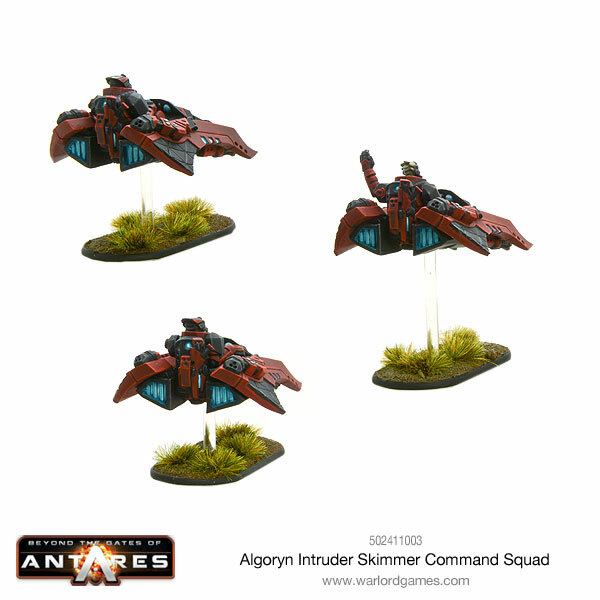 The Algoryn Intruder command bring new detailed features and use the ‘Follow’ special rule allowing them to command multiple nearby units each turn of the game. Their main weapon is their speed, the ability to have presence on different parts of the battlefield really keeps your opponent on edge. The ‘reach’ of these models is massive, enabling you to command nearby units by using their ‘Follow’ special rule ensuring you can capture that objective last minute or gun down that last unit hidden away. Keep on the move and use line of sight blocking terrain as much as you can to avoid loosing this highly mobile and effective Command unit. Bring an entire Strike Force of over 700 points to bolster your existing Algoryn forces as they battle across the Antarean universe! 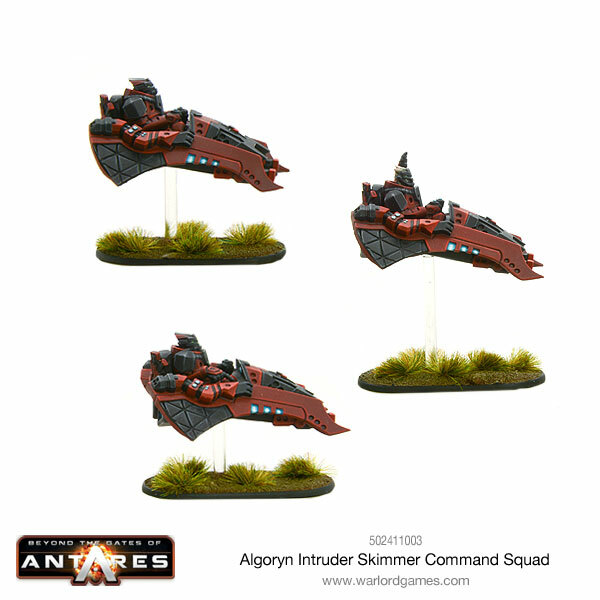 The Algoryn Intruder Strike force weighs in at £95 but it is well worth it in terms of value three skimmer squads and a command Squad are just going to allow massive opportunities for flat footing your opponent almost every turn, hopefully the C3 and the other forces will get some specialised forces soon. The Post to End All Posts…..
﻿Hello… Can I interest you in some Mech Action?